TL;DR version: to set the Start screen to provide a list of frequently-used apps similar to Windows 7, go to Taskbar properties, Navigation tab, check the “show the apps view” checkbox and sort your app view by “most used”. Broken into two several panes, the old Start menu contains your favorite apps you’ve pinned to the top (1), frequently-used programs that populate under that (2), a search function to find apps and files (4), and various links to common locations and settings (6). Notably missing a callout is the All Programs function, which launches you into a scrolling list, a catalog of all programs installed on your PC. 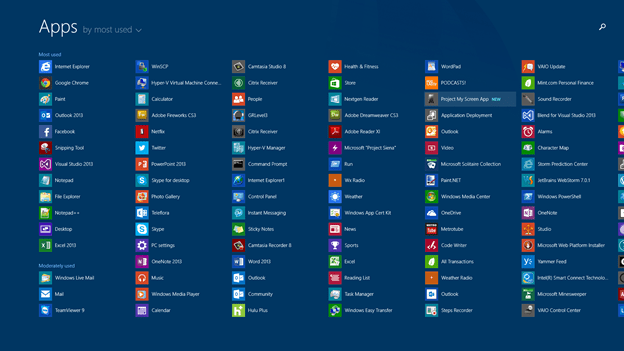 The Windows 8 Start screen is yours: only your favorite apps go here. As before, you can still browse the entire full catalog from the all apps section, which is available by flicking up on your touch screen or clicking the downward pointing arrow (which is in the same location as the old all programs button). The old shortcuts to common system locations aren’t lost either. Just right-click your Start button to view these shortcuts. Even the search remains the same: you can still open Start and begin typing to quickly find an app (or file) and launch it. Windows 8 Start screen provides the same functionality in a larger full-screen display that is optimized for touch, yes, but also for high definition screens. The 16-pixel square icons of the classic Start menu would be impossibly difficult to visually distinguish, let alone target with a mouse pointer on a 4K screen. New, of course, is the size. The Start screen is now a full-display of your favorite apps. And these favorites have special supercharged powers: they can tell you what’s new before you even open the app. New mail, even in other email folders than the inbox, new tweets, weather, news, sports, updates from your wife, everything: just a quick glance and you have all the info you want and can go back to work – without ever opening a single app. But what then, of the frequently-used programs that would bubble up and appear on the Start menu the more often you used them? Well, for one, you might not need them – if an app really is used that often, you would pin it to your Start screen or you taskbar for immediate access. But if you truly want a list of commonly-used apps that changes and updates over time, you can still get that. Before you do this, it’s worth noting the drawbacks. First and foremost, users are nearly unanimous in their desire to not have icons change positions randomly, yet this is precisely what will happen if you continue. As you use apps, these will shift around and slow you down. Secondly, you will lose the benefits of the actual Start screen such as the live tile updates. To set this up, go to your Taskbar properties and the Navigation tab. Check the box to Show the Apps view automatically when you go to Start. Now when you open your Start screen, you’ll see the Apps view. As a final step, sort them by “most used” at the top so that your most frequently-used programs appear first. If it feels slow to navigate by mouse, don’t forget that keystrokes are the same as Windows 7. Press Start, down arrow to go down the list. And unlike before, you don’t have to down-arrow past the pinned icons, so it actually takes less clicks to get there. And don’t forget, you don’t need to jump into this full-screen interface just to search for an app or file to open. Just like with Windows 7, that can be done on the side without leaving what you’re doing. 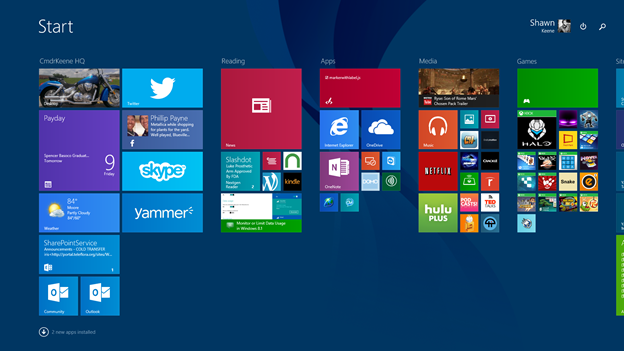 If you have Windows 8, are you using the Start screen? Do you pin your favorite people, places, playlists, and more to get live updates instantly? Or do you prefer to avoid the Start screen altogether? Let’s hear it in the comments below.